On Saturday 28 April 2018, over 30 people gathered at the Guildford Saddle Club to learn about the value and care of our old eucalypt trees. This was a joint Connecting Country and Mount Alexander Shire event, and part of the council’s Sustainable Living Series. Tanya Loos (Connecting Country) was the presenter, and we also heard from Bonnie Humphreys (Connecting Country), Kylie Stafford (Mount Alexander Shire Council) and Bev Philips (Maldon Urban Landcare Group). One of the participants, Vicki Webb kindly volunteered to write this post about the workshop. Thanks Vicki, and to all involved in this most successful workshop. Further information about caring for large old trees will be posted on the Connecting Country website in the next couple of weeks. Bev is dwarfed by a huge and healthy grey box. Photo by Bonnie Humphreys. Is there anything old eucalypts can’t do? They are a keystone habitat structure in Mt Alexander Shire, providing resources critical to species diversity – that was the message from Connecting Country on a perfect-autumn-day workshop under the box gums at the Guildford Saddle Club. Just about all parts of these majestic trees sustain a huge number of mammal, bird, reptile and insect species. Hollows in the trunk, branches and dead stumps provide shelter and nesting sites. The tough leaves are a source of food, moisture and shelter. Flowers, buds and nuts feed a large variety of species. The bark shelters bats and insects. And at the end of the tree’s life, it decomposes and provides nutrients for the soil and trees of the future. I’d heard that hollows take at least 100 years to develop, but was amazed to learn that up to five centuries are required to form a hollow large enough to host a powerful owl or black cockatoo nest. And if we want a diverse range of species on our land, we need habitat that has at least three and up to ten trees old enough to form hollows for each hectare. We came along to learn what we can do to help our trees reach these kinds of phenomenal ages. An important message was not to fuss too much. Tree health is largely determined by soil, and falling branches and leaf litter should be left in place as habitat and natural fertiliser. We should avoid adding fertiliser, to avoid nutrient overload. However, we can actively assist nutrient cycling by planting deep-rooted perennials like native lilies and grasses around the tree’s drip line. Some people said they try to help their eucalypts by removing remove native mistletoe, which takes hold in trees already under stress. We learned that this parasitic plant actually provides valuable resources such as prime foraging and nesting sites for birds such as the diamond firetail, as well as providing fruit, nectar and nutrient-rich leaves to feed a host of other species. We learnt that echidna mothers find piles of woody debris of sticks, branches and leaves the perfect place to leave their young while they forage in their territory for days at a time. This message was very timely for me … just a few days later I spotted my resident echidna burrowing into the pile in my yard left over from fire season preparations, and destined for the mulcher. It hadn’t occurred to me that piles like these should be dismantled before burning, otherwise the puggles (baby echidnas) will have no chance of escape. Even better, woody debris can be left in place to create habitat for woodland birds before decomposing into the soil, or put into a dam to help create wetland habitat. I’m more than happy for my ‘mulch pile’ to remain in place as some choice habitat. 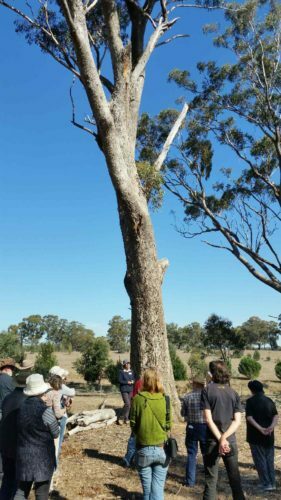 This workshop reminded me of how important our old eucalypts are, and has inspired me to make sure this precious resource is well looked after on my property. I suspect that point 13. above should be measure the circumference in millimetres and divide by pi etc. Mistletoe – our paddock trees developed a big load of mistletoe. We watched two die. A third was looking very stressed, with hardly any leaves left, just mistletoe. I called in the tree workers who cut out the mistletoe. The whole front paddock was covered with the stuff. Now, three years later all trees are looking much healthier. Lots of leaf growth. 6. Do not clear fallen branches from under trees – they provide habitat, shelter, perching points. Most excellent points Kim! My thanks also for sharing them.